DD always wanted a puppy. We said no, as they're such a responsibility and the whole family has to be committed to the idea as dogs are so dependent on humans. Eventually, we gave in and let her have a tiny kitten instead, as cats are more able to fend for themselves. 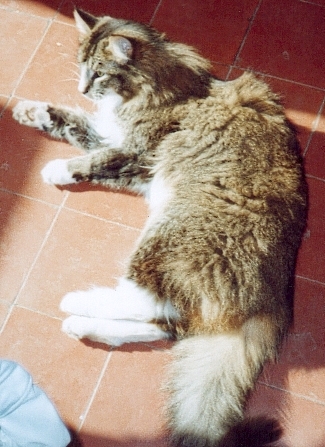 Jynx the Norwegian Forest Cat grew into an enormous hunter of four-legged furry creatures. He's an old timer now, but although he'll catch anything from shrews to squirrels, he's terrified of everything else. This includes our neighbour, who fed him on the couple of occasions our family has all been away from home together. Son No. 1 started asking for a dog the second he could talk, arguing that the cat belonged to his sister and he didn't have a pet of his own. We held out for years, but so did Son. Nothing would put him off. We told him he could open an animal sanctuary once he owned his own house. He kept on. Once he was fifteen and thinking about working with animals, it seemed like more than just a phase. We told him to do all the research, hoping the costs and work involved would deter him. It turned out that was the worst thing we could have said. He attacked the task with the zeal of a Dr Sheldon Cooper from The Big Bang Theory. 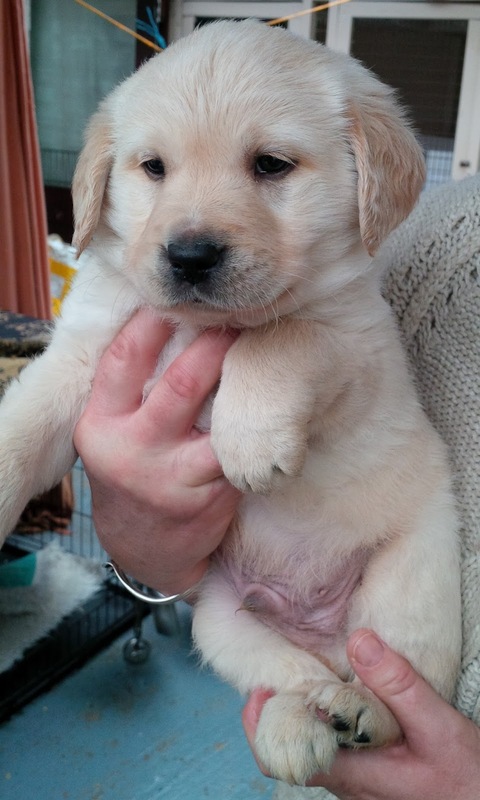 Breeds were narrowed down, and he decided he wanted a male golden retriever puppy. He even decided on a name for it—Alex. There were ten babies, seven girls and three boys. A viewing day was arranged so potential owners on the waiting list could pick which puppy they wanted. As Jeff was top of the list, his appointment was first, at 10:30am one Saturday morning. Armed with his list of things to look out for, we went to view the puppies. First we met their mum and dad, Ellie and Freddie. You can see a lovely picture of Freddie on the banner of the Care and Connect Facebook Page. Both parents were quiet, friendly and most importantly, their whole canine family had been home reared in company with several cats. We wanted to be sure of this, so our new arrival wouldn't bother with Jynx. The puppies were only five weeks old, and their resistance to the outside world was still low. We had to go through a disinfectant footpath and weren't allowed to touch the puppies ourselves, only look at them as they played around on the other side of a low partition. It was impossible to choose between between the three little dog puppies. They were all beautiful (of course!) but more importantly they were equally well grown, lively and inquisitive. We asked the breeder loads of questions, and watched the puppies playing with each other, and with her. They had the run of most of a large room, with lots of toys. There were unusual things, too—a collection of metal ladles and spoons, and tunnels made from short lengths of wide plastic pipe. Their environment was designed to make sure they grew up accustomed to all sorts of unexpected sounds and experiences. It would be our job to carry on this work of socialising Alex to people, places, and things after we brought him home. When you're getting ready to welcome a new puppy into your home, there's as much to do as when you're waiting for a human baby. And the similarities don't stop there! Next time, there are tears at bedtime and sleepless nights, so make sure you don't miss the next episode. For more news about Alex, life here at Tottering Towers and (with luck) a recipe for Orange Polenta cake, drop me an email at christinahollis(at)hotmail.co.uk with the words "Spring Newsletter" in the subject line.